Seriously cute spotting fun, as you chase an elusive Strawberry Moshi through rainbow-bright landscapes in Mushroom Forest, Delicious-Land and Moonlight Mountain! 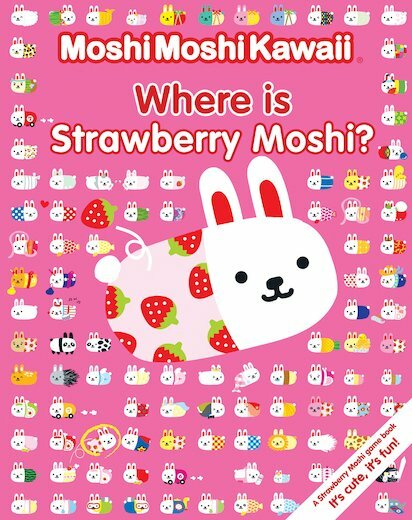 Where is Strawberry Moshi? Well – this adorable white fluffball really doesn’t want to be found. She’s having far too much fun larking round in the wacky, colourful and exotic scenes on every page. And so are all her friends! But if you’re careful, you might be able to track them down in these picture puzzles and mazes, full of gorgeous images for your visual delight! All Moshi love to dress up! Create your very own outfit for them. Download cute Strawberry Moshi wallpaper for your computer. Where is Strawberry Moshi? Colour the picture to find her. Cute Strawberry Moshi wallpaper for you to download. Download this cute wallpaper for your computer.